If you use your garage as a workshop, cold weather can keep you from DIYing for months every year. But there are plenty of ways to reclaim your workbench. We’re here to help you figure out how to heat your garage so you’ll never again have to hang up your tool belt for the winter. Special thanks to the team at Cadet Heat for sharing their expert tips. In the tables below, we’ll look at the pros and cons of five common garage heating options. 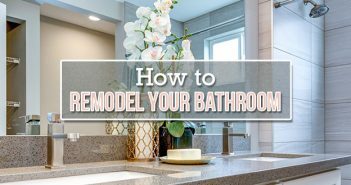 We’ll also cover whether each option is a good candidate for DIY installation. With that information in hand, you’ll be able to decide the smartest way to heat your garage. What Is It? If you tend to have mild winters, you can probably keep your garage at a comfortable temperature by simply insulating your garage door and windows, and weather stripping exterior doors. You’ll likely still need to wear some layers while you work, but beefed up insulation will keep your garage much warmer than the outside. Insulation and weather stripping are typically very affordable. No ongoing costs once installed. Not a good choice for areas where temperatures regularly dip below freezing. 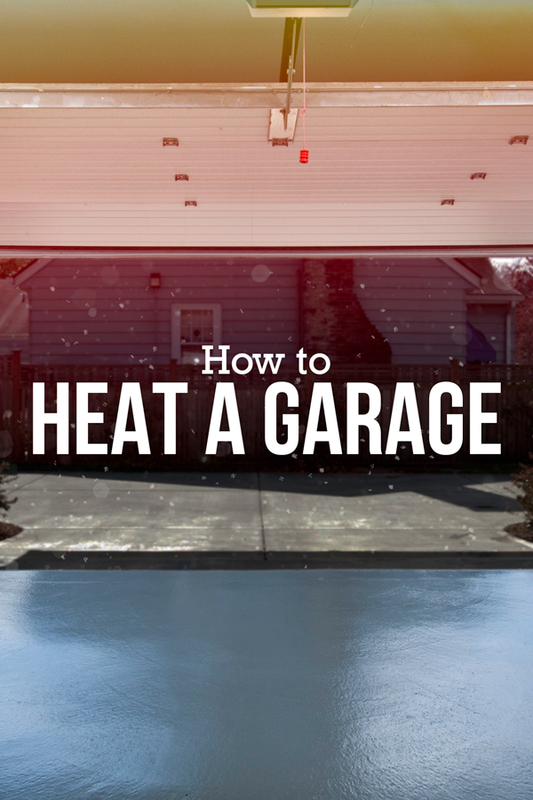 You won’t have control over the exact temperature in your garage. DIY Friendly? Yes! According to Lena Crocker of Cadet Heat, “Adding insulation is an easy project for most DIYers that with will help limit heat loss and keep your garage warmer.” Most homeowners will have no trouble adding insulation to windows and weather stripping to doors. Insulating a garage door is a bit more involved but still very doable for the average DIYer. Need to make room before sealing up your garage? What Is It? Electric space heaters for your garage are really just bigger and more powerful versions of the portable units you might use to warm up your office or bedroom. If floor space in your garage is limited, you can even find electric space heaters that can be mounted on the wall or from the ceiling. Current energy-efficient models typically won’t raise your electric bill that much. Can also be used inside the house if needed. Can take longer to heat up a garage than other options. Might be difficult to use in garages with few outlets. Will be less effective in an uninsulated garage. DIY-Friendly? 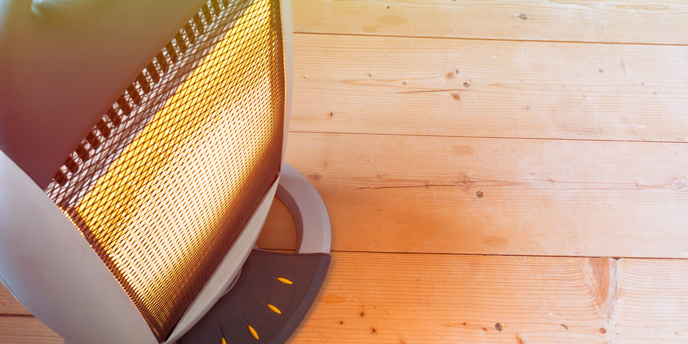 Very – heating your garage with an electric space heater is as simple as finding a good spot and plugging it in. What Is It? 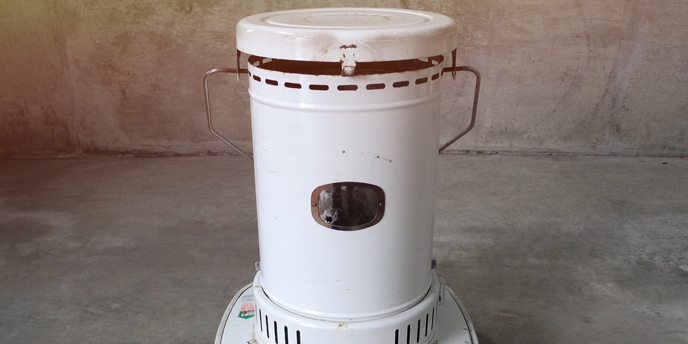 Combustion space heaters use a fuel source such as kerosene or propane to create heat. Most need to be run on a specific fuel type. However, there are models that can run on multiple types of fuel, giving you the flexibility to buy whichever is currently cheapest. Most models will heat an average-sized garage fairly quickly. Can be used even during power outages. Often cheaper upfront than an electric space heater. Very noisy. Many people equate it to the sound of a jet engine. Fuel odor may bother some people. You’ll have ongoing fuel costs. Combustion introduces moisture into the air, so there’s a risk of rusting your tools or vehicles if you frequently use your heater for long periods. DIY-Friendly? Yep – just like with an electric version, all you need to do is set it in place and fire it up. Combustion heaters produce carbon monoxide. They should never be used without cracking your garage door several inches and/or opening windows to create ventilation. They should also never be used inside your home. Even in well-ventilated garages, you should consider installing a carbon monoxide detector for added safety. What Is It? A ductless mini-split system is made up of an air-handling unit, which is installed inside a room, and a compressor located outside. These two components are connected by a conduit. The entire system is powered by electricity. Lots of flexibility for placement. Can be installed along the floor, mounted on a wall or suspended from the ceiling. Many models come with a remote for easy control. A great choice for heating a garage you want to use as an additional room. Some units can also provide cooling in hotter months. Upfront costs are much steeper than for most other garage heating options. Filter must be cleaned monthly since debris can build up in a ductless system. Not the best at really cranking up the heat. In very cold climates, you may need supplemental heat. DIY Friendly? Only if you have advanced DIY and electrical experience. 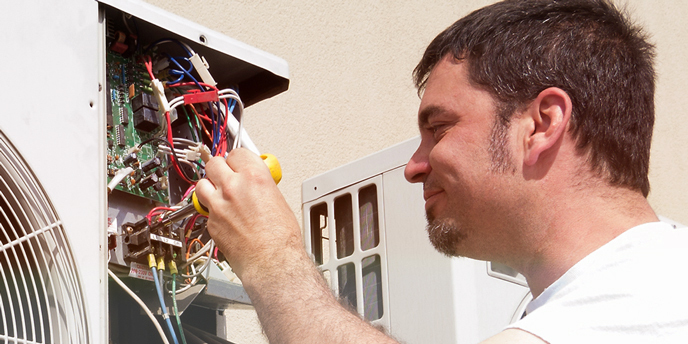 In most cases, an HVAC professional should install your system. Is that stack of boxes blocking your heating vent? What Is It? 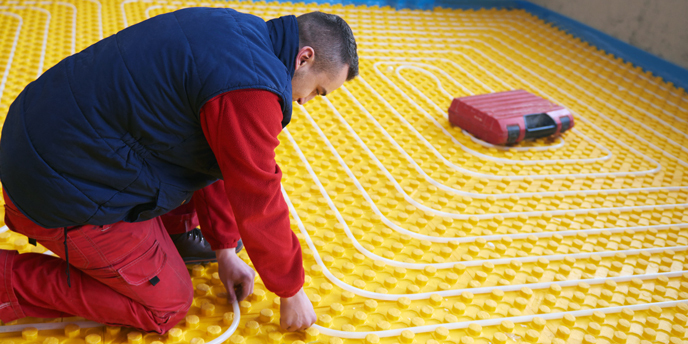 Radiant heating systems are installed under a floor or as panels in the walls or ceiling. The system uses infrared radiation to heat a surface itself rather than the air of the room. There are several different types of both floor and wall/ceiling radiant heat systems, so do your research to see which type is best for you. Very low operating costs once installed. Floor installations heat a space more evenly than other options. 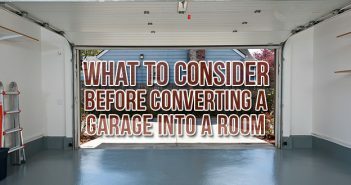 This avoids creating spots that are significantly warmer or cooler than the rest of the garage. Are expensive to install upfront. Installation is an involved process, especially for floor systems. Moisture may build up on the surface where the system is installed. DIY-Friendly? No – this garage heating option should always be installed by a professional who has experience with radiant heating. Decided how you’re going to heat your garage? 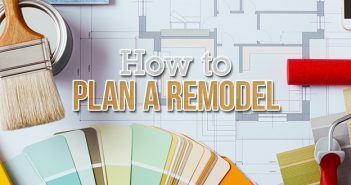 Check out our Home Project Guides to get some inspiration for the next project you’ll tackle in your toasty new digs. Got your own garage heating tips? Comment and share the wealth. Why don’t you mention the easiest install a small wood stove?? Installing a woodstove can be prohibited or require building permits and fire inspectors certification. Totally unsat for woodworking. Its a lot of work to keep going even at a 50 to 70 degree faranheit range. dead right ,you can get off cuts from building site and they are glad for you too take em. Why not solar??? I live in Minnesota so you know it gets COLD here. I have a solar panel that heats air and 2 small fans that run on solar power to increase circulation. That combination heats my 12′ x 26′ shop ( when the sun is shining) very well. Can I see your solar setup? I have radiant floor heat in my 30 x 40 foot garage hooked to my propane fired boiler. I leave it set on 55 and I can go out there and work in a t-shirt and be comfortable. I live in central Maine and I spend between 60 – 80 dollars a month tops to heat this area, depending on weather. Hi, I’m moving to Maine this summer. I’m curious about your installation of radiant. I’m a fan, for sure. Was yours a retrofit or did you install the tubing in the concrete prior to popuring the slab? I’d like to install a retro system on which I could park the cars when I’m not using the tools. The propane boiler installed in a separate area w/ ventilation to support combustion and a liquid filled in floor heating system is the best. In floor water systems are really available and manufactures can walk you thru the installation. 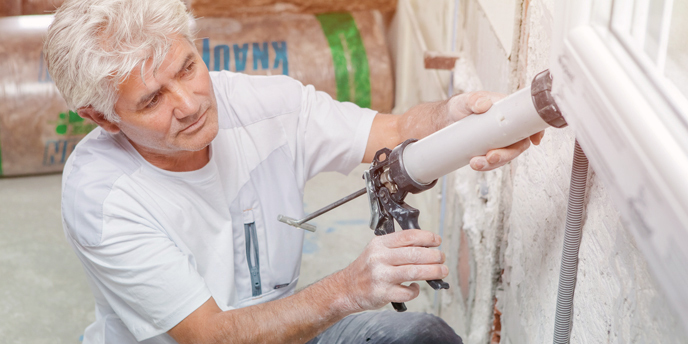 YES you will need to pour a new 4″ concrete floor on top of your existing floor using insulation board which provides insulation, and attachment for the new 1/2′ diameter plastic piping . Your system will involve a boiler with aquastat to maintain boiler water temperature (where temperatures vary widely you can add a aquastat to vary boiler water temperatures ti reflect outside conditions), a small circulating pump, room thermostat, and misc. valves. Manufacturers will gladly help. Mix into water antifreeze to protect against freeing in case of power loss etc. There is no better system I could recommend, albeit the more expensive first cost. This will last a lifetime and provide an even heat at the level you occupy, i.e., the floor. One caveot; this is a system you turn on in October and shut down in April as it takes a while to heat the floor and space; but once achieved there is no bette, more even heating system. The concrete floor become a radiant panel. A friend of mine installed a regular gas furnace with the vent pipe to the outside wall of his garage. I’ve fitted a Proper 2000 unit to my garage. This is a propane powered vented heater, so via heat exchanger it heat the garage with blown hot air whilst all of the exhaust gases and moisture are vented to outside. Roughly equivalent to a 2000w electric heater, heats my three bay garage quickly and efficiently. It’s also fitted with a thermostat so I can leave it on when I’m not there. What’s the manufacturer and model number? I couldn’t find anything under Proper 2000. I’m in NW Indiana and also have a 3-bay garage that I would like to heat. Thanks! Natural gas heater hung on wall vents outside. Cheapest to operate and efficient. Can run with a programmable thermostat too. I built a 24×36 garage with in-floor radiant heat. Best choice I ever made. You can open the door to move stuff in and out in -30 temperatures and the garage is warm again almost right away. The floor acts as a giant heatsink which does not let the room cool very quickly. My other two favourites were always having warm tools (common in any heated garage I guess) and standing on a warm floor. I found even keeping the garage a few degrees above freezing in our nice cool Canadian climate and I could stay warm because my feet weren’t on frozen concrete. If you can afford it when you build, I wouldn’t even think twice. We moves two years ago. This summer I’m building another shop and will not consider any heat other then I – floor. Electric conterflow furnace works great in my shop. Controlled by thermostat on a 40amp 220 circuit. Bought mine from Grainger. I setup a filter on the intake side. Works great. Easy install. Heats up quick. Doesn’t take up a lot of space. Just add a duct from your existing furnace. Mine stays comfy and cars warm in winter. Close the vent in summer. Building code does not allow this in our area. This statement cant be farther from the truth!, in fact the exact opposite. I have hydronic heat in my garage floor 24 x 30 and a water to air heat exchanger to heat the upper 14 x 30 area, heated by a Bosch condensing Natural Gas boiler. Its dry quite, safe around flammable liquids and mostly importantly it only cost about 67$ a month to heat at 68 F thats just over 2$ a day. I use a forced air kerosene heater (55,000 btu) to warm a 14×24 garage up quickly, turn it off then use a convection kerosene heater with a shop fan blowing to keep it warm. Ii have both a wood stove and a natural gas fired FCU in the detached garage/shop, Both work great but prefer the wood stove with a water container on top for adding humidification. Sorry, please explain natural gas FCU. I have a 3-bay garage that I would like to heat efficiently. Thanks! I do contracting and one we have found to have the radiant properties of in-floor radiant systems but can be installed alongside an existing slab is comfort cove electric radiant haters. They are sleek, can be instalked on thr wall and heat objects such as floor amd tools rsther than just the air like a minisplit. I live on Long Island N.Y. within a home I designed and built to have Electric Base board radiant heat; each room on its own thermostat. To qualify for the preferred Electric heating rate I also had electric cooking and hot water. My total bill was estimated by the utility co. to cost approximately $600. PER YR. in 1973. When I built my home our utility Co was building a nuclear power plant, still the safest cleanest system around. Unfortunately the fear mongers prevailed and the plant was abandoned leaving us with a $6,000,000,000. NON PLANT. When my electric bills reached $600. per month I through in the towel. I tried reverse cycle Electric Heat Pump w/ Forced Hot Air (the worst system in my opinion), Gas fired forced Hot Air system; still unsatisfactory, but marginally less expensive, and I supplement it with some electric base bd heat. I have since convinced my daughter and son when building their houses to install “In Floor Heating”, and that provided a happy ending to my story. Utility costs on L.I., NY are still vary high no mater what you use, and I built the best well insulated homes, in case you were wondering. Your comment about a Mimi-split heat pump not being adequate in colder regions, I believe is not correct. I live in Canada and heat my house with a mini-split, which still produces heat at -15 degrees F. I do use my wood furnace once the temperature dips below -10 because the mini-split loses efficiency at that temperature. The bonus is the cheap air conditioning in the summer. I tried to calculate the cost and my best guess is about $2-3 a month. uses a line voltage thermostat and is ducted through the wall and up on the outside. I live in Colorado. I keep the thermostat at 40 degrees so nothing will freeze. If I am working on a project I will raise the temprature to what is needed. Pros: Adjustable temprature, Doesn’t allow anything to freeze, Natural gas, no fumes. Warm autos, freezer and fridge work properly.